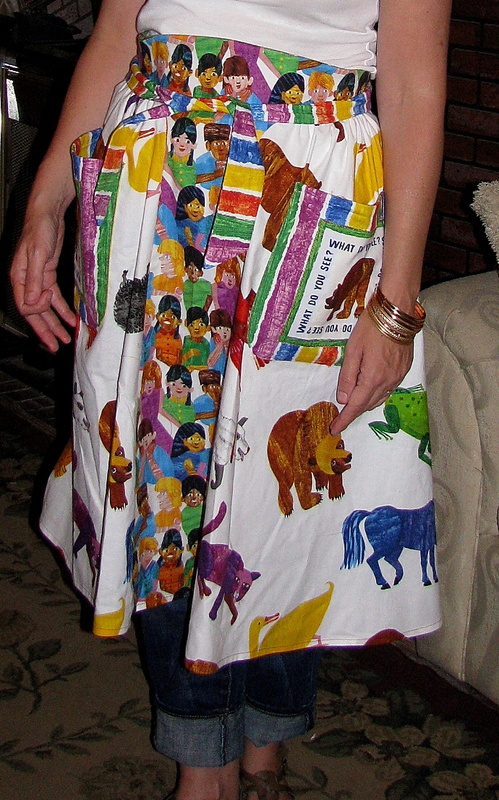 My sister’s birthday was over the weekend so I made her this apron. She is a first grade teacher (the best ever!!) so I used this wonderful Brown Bear Brown Bear fabric. I found the fabric at fabric.com. My sister’s blog is Here In First Grade and it is great source of information. I made this using an old shirt of my FIL. She loved it. It is very easy and I’m working on a tutorial for it. However, we need to do some regrouping around here so I will take a break from all my blogs until August. Talk to you soon and pray for rain. I love you! You are so talented. That is so creative!! I bow to you Seamtress Diva.